Papua New Guinea is a country where people often live separated by geography and history, focused on their own nearby community and tribe. Singsings, though, are gatherings where tribes share their traditional dress, music, and dance. 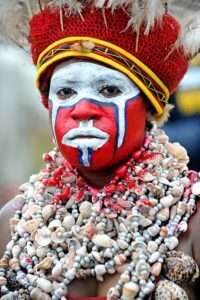 The largest of these, named for the town in which it is held, is the Goroka Show. In 2018 the Goroka Show will mark its 61st anniversary. It began when members of the Papua New Guinea police force who came from Australia were looking for ways to encourage tribes to interact with each other. Remembering tribal gatherings in Australia, they decided to introduce the idea to PNG. These days natives of Papua New Guinea and visitors from across the world come to experience the Goroka Show — and it will be part of Wandertours 2018 visit to Papua New Guinea. You will see dancers and singers who paint their faces and bodies in many colors and designs. They will dress in costumes which might include head and body adornment made of feathers of all sorts, bone and wood ornament, and in the case of the Mudmen from the Asaro Valley, head and face covering made of clay and meant, some say, to suggest or evoke ghosts and spirits. One story tells that tribe members, fleeing an attack, hid in the Asaro river. When they rose up their bodies were covered with the light colored mud from the river. Their attackers thought they were spirits and ran away. Later, still covered with mud, they went to see where the other tribe was. Their adversaries, seeing them on land, were even more convinced they were seeing ghosts and were frightened away. 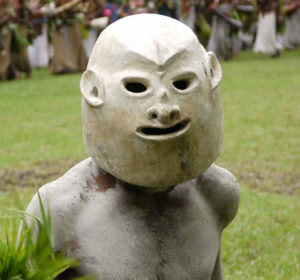 Adding fearsome masks to their attire (they thought river mud would be poisonous if applied to their faces), the Mudmen built up the battle attire for which they are still known. The singing and drumming you will hear at the Goroka Show will feature vocal harmony and rhythm, and different patterns of drum sounds. It is bound to have a lot of variety: more than 700 languages are spoken on Papua New Guinea. Many of the songs and dances tell stories related to local myths, legends, and history, and may have ceremonial purposes too. If you’d like a preview of what some of the music may be like, Healing, Feasting and Magical Ritual: Songs and Dance From Papua New Guinea is a recording which offers music from five of Papua New Guinea’s regions. It can be quite a sight, and sound, as the dancers and singers from varied regions compete to show off their cultures and tell their stories through music, dance, and costume at the Goroka Show. Many New Guineans come to experience and learn about their own culture. Visitors from around the world join them. Would you like to join in too? Find out more about Wandertours Papua New Guinea tour which in September 2018 will include the Goroka Show.